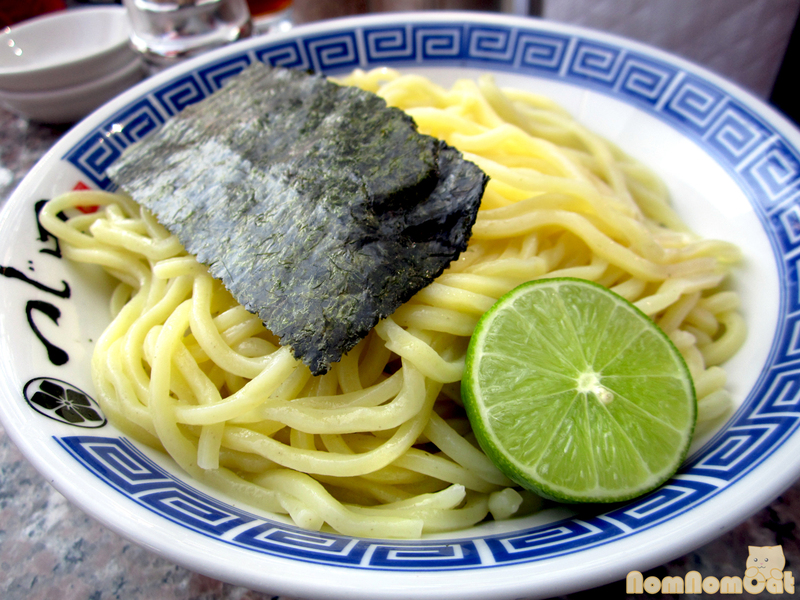 Tsukemen ramen, or “dipping noodles,” is no ordinary bowl of noodles. In fact, the first thing you’ll probably notice is that that noodles have no soup in them at all! In this style of ramen, hailing from Fukuoka’s Hakata region like some of our other favorites, the soup is dense and served on the side (either hot or cold) as a sauce. Lift the noodles with chopsticks and dip them into the sauce to savor the melding of flavors that only 60 hours of simmering could produce. This 60-hour tonkotsu broth, and the unique serving and eating method, is what brought us to Tsujita LA on a lovely Sunday afternoon. We met our friends Lilia & Anthony there and wow, was there was a crowd! There’s quite a wait during lunch, likely because it features ramen prominently on the menu. Dinner at Tsujita LA transforms into izakaya style fare, although they expanded across the street to add Tsujita Annex, serving up ramen all day long. On the bright side, the wait staff took our order ahead of time so the food arrived shortly after our table was ready. We were finally seated at a secluded outdoor 4-top, almost as though we had our own private patio. Best seats in the house! (Well, outside…). Well let’s start at the beginning. 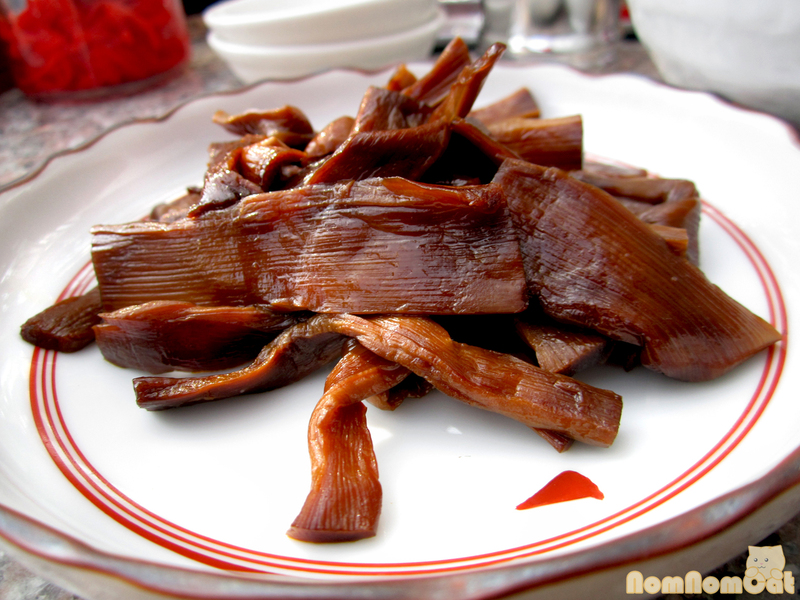 The noodles are thick with an excellent texture – firm, chewy, toothsome. Or as the Taiwanese slang goes, very QQ. There’s a suggested method to eating tsukemen ramen in three phases. First, dip the noodles, as is, into the thick and very decadent sauce-like soup. This is the soup. If we refer to a regular ramen soup as “broth,” then this by comparison is practically a demi glace. Intensely flavored and incredibly seasoned with the pork bones (which, according to their website, had stewed for 60 hours). However, because it was so concentrated, I found this sauce-soup to be a bit on the salty side as well. 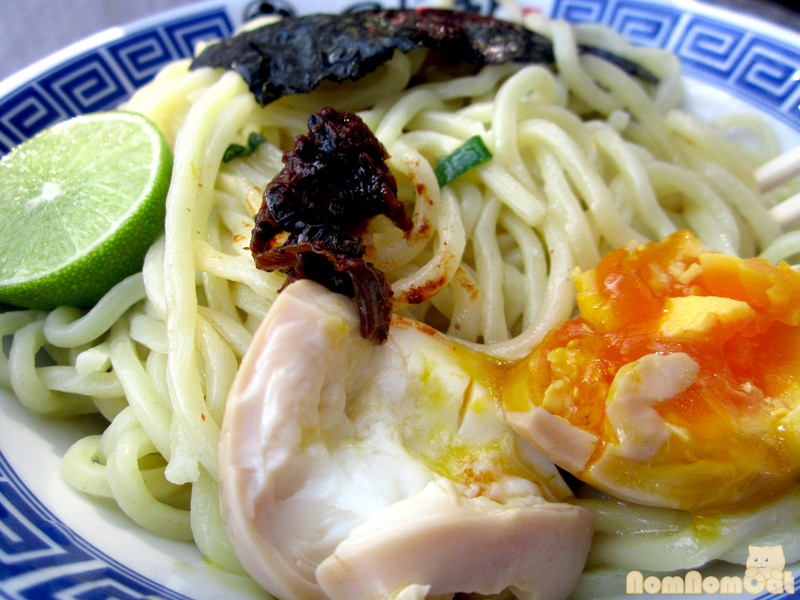 After polishing off about a third of the noodles, proceed to phase II – squeeze lime over the noodles and enjoy a whole new explosion of flavor. It’s a different experience entirely, with the bright citrus cutting through the unctuous sauce. No bite is exactly the same. All three of us (aside from Martin’s tonkotsu) had the ajitama tsukemen ramen. 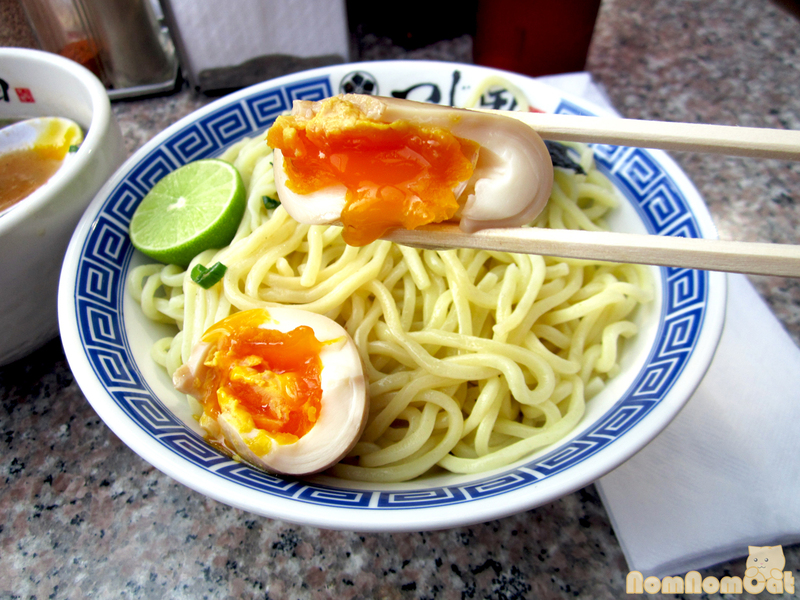 Ajitama, literally “flavor ball,” refers to the soy sauce marinated soft-boiled egg. The egg at Tsujita LA completely blew me away. I mean look at that show-stopping ooze of gorgeous bright orange yolk. AMAZING. Absolutely amazing. I would return just for the chance to split open another one and experience the joy of a perfectly cooked egg all over again. Anthony mixed things up with extra noodles and Lilia made sure to ask for extra limes (proudly described as “FREE!” on the menu), so I wanted an extra of my own — bamboo! I love menma in my ramen, and you can tell by the dark color of these that they are nicely seasoned. Note that the regular order does include a few slivers of bamboo by default. My favorite garnish, hands down, was the spicy pickled mustard leaves. Dark brown wilted leaves coated in fire engine red chili oil, a forkful of these really pack a punch. The picture above illustrates my first tentative taste, but rest assured, after I discovered how awesome they are, I piled it on high and turned all of my noodles a festive red hue. Sniffling through my nose and sucking in air to cool my tongue, I really, REALLY enjoyed my tsukemen ramen with that addition! Oh, yes – the third phase of eating tsukemen (which we actually didn’t get to participate in.. possibly since we were sitting outside, away from the kitchen). 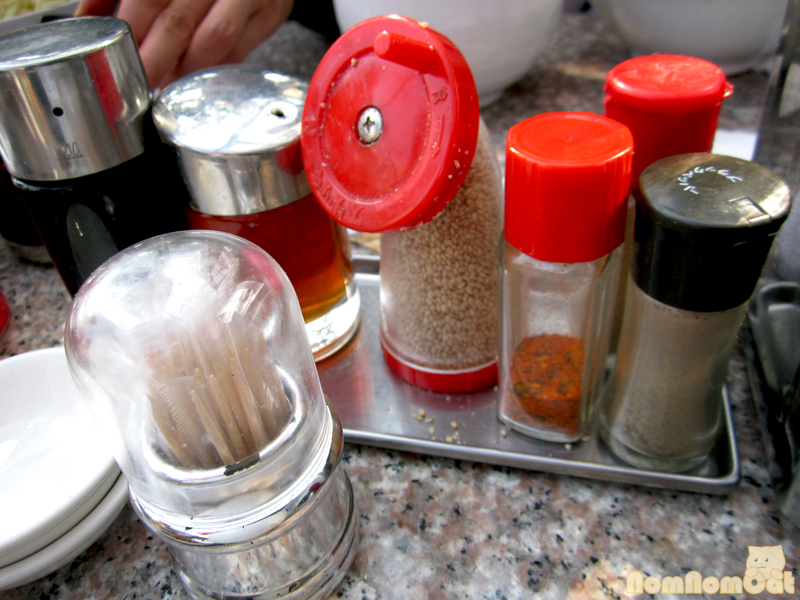 The staff provides hot water to dilute the dense sauce into a drinkable broth. Sounds like it would really round out the meal! More reason to return and enjoy a complete experience. As we mentioned last week, the Best Ramen in LA is a contentious topic among diners, bloggers, Yelpers, anyone who enjoys patiently lining up to slurp away some form of this Japanese noodle soup. 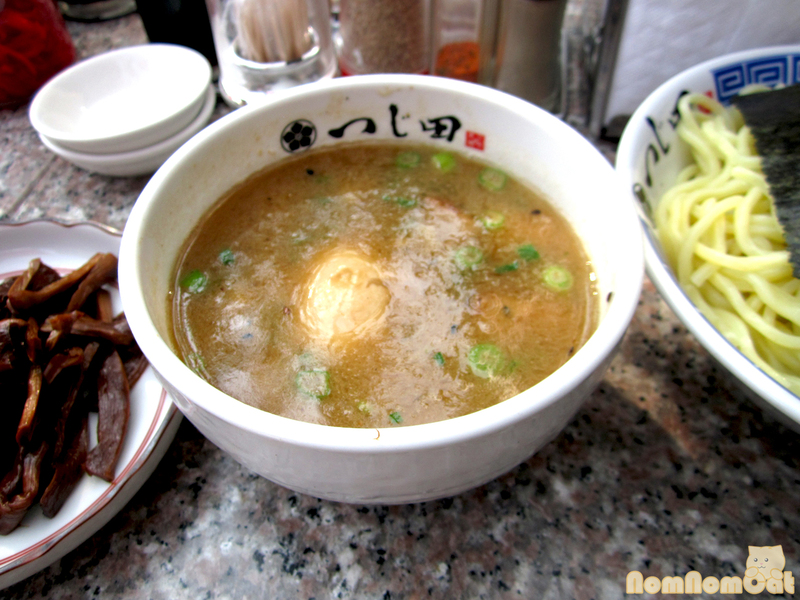 For me, Tsujita LA just rose to #2 on my list, edging out Shin Sen Gumi and second only to Daikokuya. Martin will may disagree but just shoot him a quick message and I’m sure he’ll be happy to share his personal list with you. ;) I’d venture to guess that every Angeleno has a ranking of favorites. But if your idea of ramen is simply soup and noodles in one bowl, you’ll definitely have to try tsukemen ramen for an experience unlike any other. This post is part of the monthly link up party Our Growing Edge. This event aims to connect food bloggers and inspire us to try new things. As a lover of ramen and all things noodle, I’m a little ashamed to admit that I had never tried tsukemen ramen before going to Tsujita LA. But I tried it, I really liked it, and I’m a better noodle-eater thanks to this experience. This month is hosted by Becky at My Utensil Crock. Cheers! Time to tackle a contentious topic — the best ramen in LA. Los Angeles is teeming with authentic, hole-in-the-wall ramen joints that have attracted quite a cult following. We used to hop in our car and brave the network of freeways all the way to Downtown LA, only to viciously fend off muggles in our search for precious street parking. And for what? To stand out on the sidewalk in the cold (because of course, ramen tastes best when it’s cold outside) for HOURS, awaiting a coveted seat in the shoebox-sized Daikokuya location off 1st Street. But with the popularity of ramen rising, all of the greats have made the move to Little Osaka. We were most excited, of course, for the advent of Daikokuya. Rejoice, Westsiders! The Interior… that looks like a busy Tokyo street! This Westside location off Sawtelle has just about everything going for it — the parking is free and easy (the shopping center has a multi-story structure), the wait is considerably less as the venue can accommodate a bit more seating, and the food is just as good as the original Little Tokyo location. Winner winner, ramen dinner. Just remember to sign up on the clipboard just inside the door; otherwise you’ll end up standing around looking confused among the throngs of visitors. If you get nothing else from this blog post, I hope we can at least help prevent you from looking like a newbie. 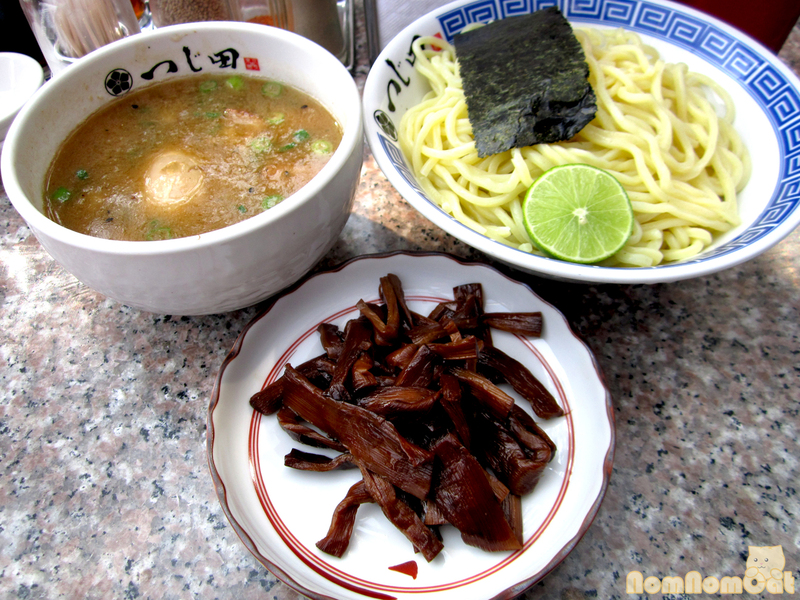 As we’ve mentioned before, there are many styles of ramen in Japan. Tokyo style ramen is different from that of Sapporo or Kyoto, and they’re all delicious in their own ways. 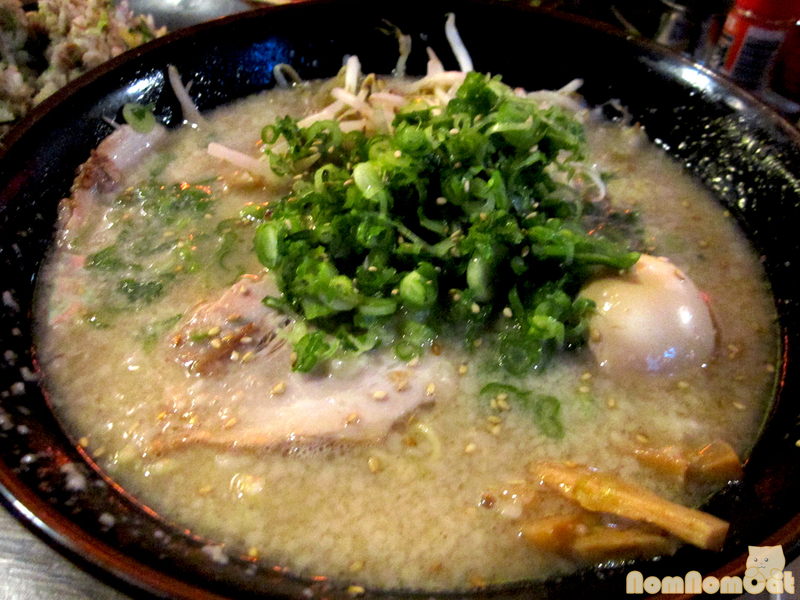 But if pressed to choose a favorite, Martin and I would have to give a nod to Hakata style tonkotsu ramen. 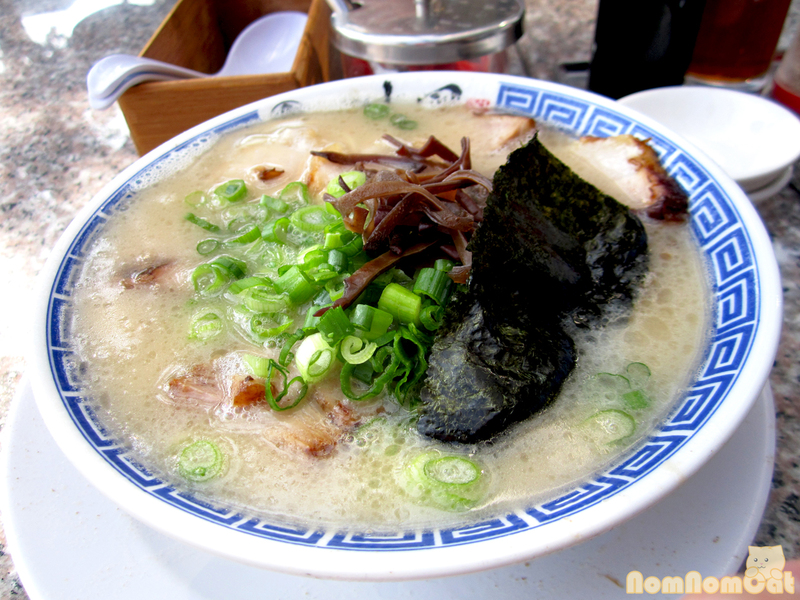 Tonkotsu, not to be confused with tonkatsu (breaded and fried pork chop – also delicious), refers to a broth made from stewing pork bones for a very long time to render the fat and yield an unctuous, guilty-pleasure experience. Cue the namesake Daikoku Ramen. Make yours even more decadent by ordering it kotteri-style… Japanese for “rich” or “thick” but I translate it as extra fatty. The presence of extra fat globules is even enough to turn the broth opaque in color, but the sensory overload from this flavor boost is so worth it. The noodles are of the thicker variety and are always al dente. Add in thick slices of tender chashu pork, strips of bamboo (menma), a hardboiled soy sauce egg (ajitama), and a generous handful of green onion (negi) and you have what I personally believe to be worthy of the title Best Ramen in Los Angeles. Ramen is not the only dish worth ordering here. If you have the stomach space, make room for an order of gyoza. Hand rolled, rectangular-shaped potstickers that are wok fried and always end up with plenty of extra crispy browned edges. 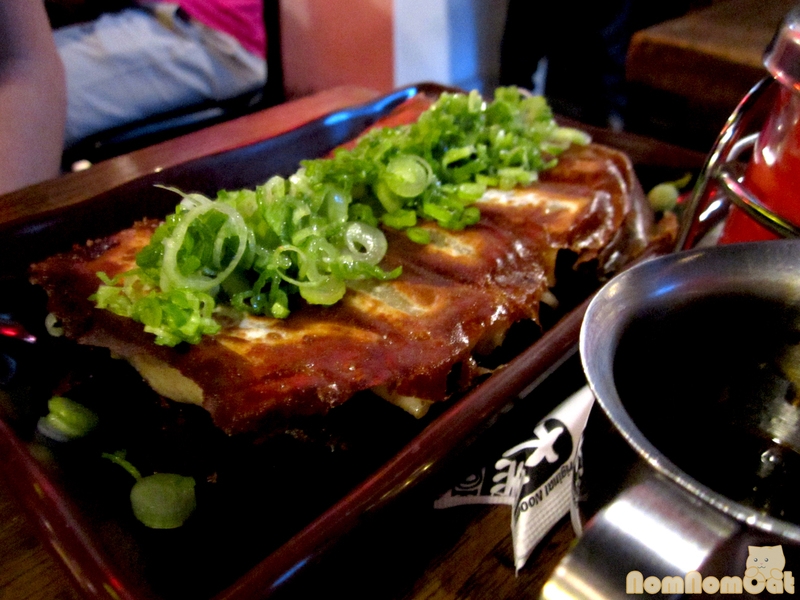 Served under a mountain of green onions and alongside a tiny pitcher of sweet and savory gyoza sauce. If I remember correctly, one order is comprised of an odd number of dumplings, leaving us to duel to the death over the last one. For the extra hungry (or for those who want to save leftovers for the next day’s lunch), you can also add on a “side dish” and make your meal a ramen set. 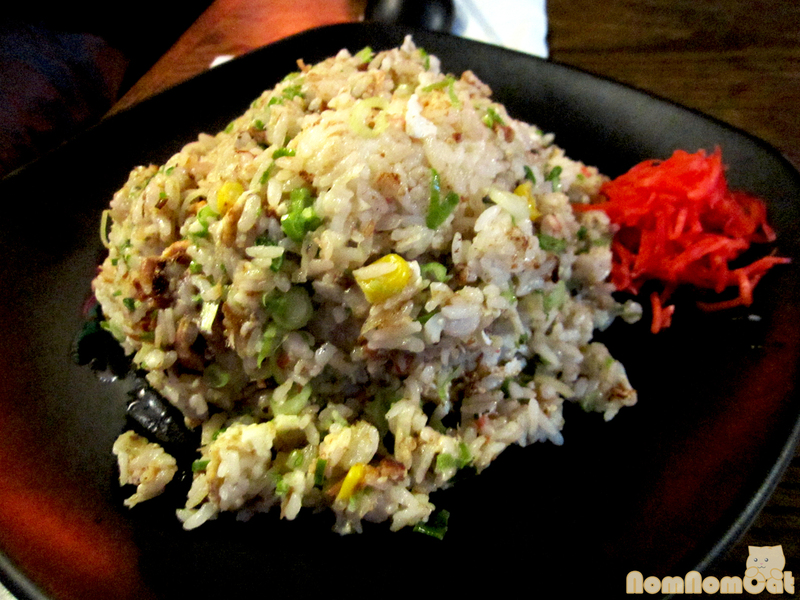 Oyakodon (chicken and egg, over rice), chashu pork over rice, and our favorite — pork fried rice (chahan). A side order is one giant scoop, and an a la carte order is two giant scoops. If we’re both in the mood for extra chahan, we’ll split the a la carte order (I think it comes out to $0.50 cheaper or something like that). Wok fried rice sprinkled with bits of pork, corn, and green onion and served with pickled red ginger (beni shoga), the only thing better than eating this on the spot is bringing it home and drizzling sriracha over a reheated portion for the most awesome brown bag lunch ever. 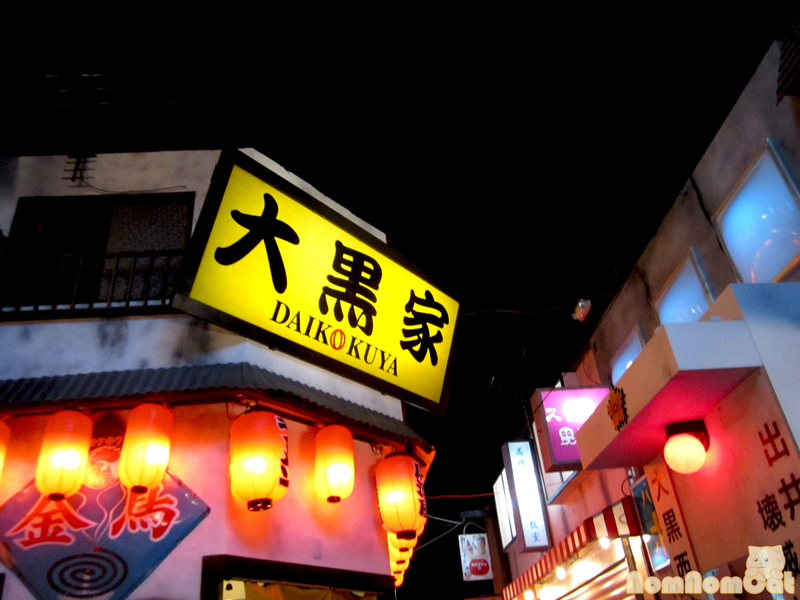 The Little Tokyo location will always be our first love, but this closer and newer Westside Daikokuya, with its interior decor that resembles a Tokyo street, is really winning us over. Plus, they have takoyaki. I haven’t ordered it yet, but that’s one of my favorite things in the world so you can bet I’ll be trying it soon. The food is stellar and the service is so friendly; they’re very attentive about refilling drinks (including the iced green tea!). I even left behind my camera here once, and they very kindly held it for me by the closely guarded cash register for safe-keeping. Run, don’t walk, to my pick for Best Ramen in LA.